While Ronnie Raymond was one of the key recurring characters during The Flash Season 1, his time in Season 2 was short-lived, seemingly perishing in the premiere. Martin Stein has since found a new Firestorm partner in Jefferson Jackson for Legends of Tomorrow, so The Nuclear Man’s future is safe on TV. However, Robbie Amell hinted last month that he would be back on The Flash, and sure enough, it’s now official that Ronnie Raymond will be seen again later this season… just not as the one audiences know well. Executive producer Andrew Kreisberg recently admitted we'll be getting an Earth Two version of the character, who instead went down a dark path. Nothing identifies you as evil quite like having “death” in your moniker (just ask Arrow’s Slade Wilson), and EW's report makes it sound like The Flash’s Deathstorm won’t be someone you want to mess around with. 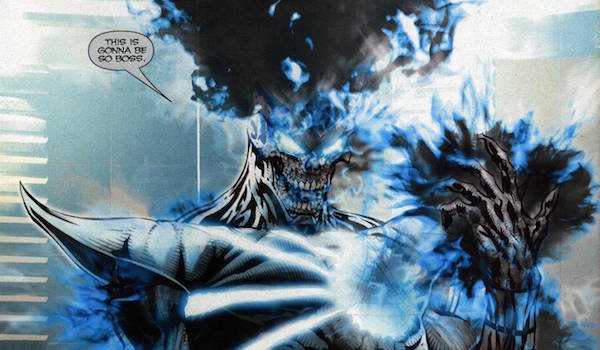 During 2009’s "Blackest Night," Deathstorm was the deceased Ronnie Raymond who was brought back as a Black Lantern (think of an intelligent zombie wielding a power ring), who had all the powers of the original Firestorm. Even after Ronnie was legitimately resurrected by the White Lantern, Deathstorm continued to operate as a separate entity during "Brightest Day" until he and the other independent Black Lanterns were destroyed by the White Lantern’s light. It looks like aspect of that Deathstorm will be combined with the New 52’s Deathstorm, who is Martin Stein from Earth 3, for The Flash. A recent promo for the latter half of Season 2 showed that the Earth Two Caitlin Snow is the Killer Frost we’ve all been anticipating, and just like in Earth One before Ronnie’s demise, this Caitlin will be married to her world’s Ronnie. This turns the tables on their usual antagonistic relationship in the comics, instead causing chaos as a couple. So when Barry and several members of Team Flash head over to Earth Two later this year, they’ll run into these corrupted doppelgängers. As for Earth One Ronnie, it’s unclear if the Deathstorm episode will confirm whether he’s truly dead or not. When we last saw him in “The Man Who Saved Central City,” he had been sucked into the temporal singularity above Central City after separating from Stein. In the world of comics, no body usually means that someone isn’t truly dead, so it’s possible that Ronnie was simply transported to another Earth. However, if he really did bite the dust as everyone on the show assumes, then fans are going to have to get used to seeing dark Ronnie operating, assuming he survives past this upcoming episode. The Flash will return with new episodes on Tuesday, January 19 at 8 p.m. EST on The CW. Here's when the other midseason shows will be returning.